We are so excited to launch this collection of four brand new American Hardwood floater frames designed especially for displaying deeper works of art on canvas. If a combination of simplicity, sharpness and enduring warmth is what you crave, take a look at what these new frames can do for your canvas. These sleek beauties take the modernist aesthetic of floating canvas with its sleek, crisp edge and a minimalist L-shaped profile. Made in America of solid wood and finished with natural stains, their style is underpinned by the superb quality and craftsmanship you have come to expect from American Frame. Choose from one of four beautiful tones: Ebonized Walnut, Natural Maple, Cherry and Natural Walnut. Here is an example of a canvas using a 1/2" float between the painting and the frame in Natural Walnut. See how the art appears to be suspended in rather than attached to the frame? A beautiful, modern, quality art treatment. These frames are simply striking. They will stand 2” off the wall and can accommodate canvases up to 1 ½” deep with a float of up to ½” between the edge of the canvas and the frame. Remember that unlike a traditional picture frame, a canvas floater attaches to the stretcher bar from the back of your canvas, allowing the work to appear as if it is suspended in space. 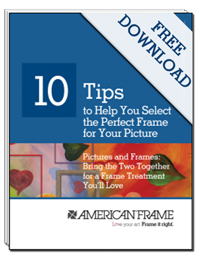 There is no need to order any other framing materials like acrylic, mat board or backing boards. All that is needed is the frame and hanging wire. As always, we will join the corners for frames up to 54 united inches and pre-drill the holes for securing the canvas to your frame unless you ask us not to. If you have any particular questions about measuring or ordering your custom canvas floater frame, feel free to Ask Mike or contact customer service at (800) 537-0944 M-F 8:30 – 5:30. As it’s our 40th year (and we are in love with the number 40), we decided to introduce these frames at a 40% discount through March 13, 2013. Take advantage! What a great time to try something new! Free follows for ig coming right up. Cricket is well known everywhere throughout the world with the exception of Europe and USA. This diversion is well known particularly in Asia and a huge number of individuals play this amusement consistently. You need to take ukbestessay in a few procedures and ought to play this diversion so deliberately. This is the worst research writing services I have ever gotten, like what is the point of this? I am very dissapointed in seeing this, I expected more from you here !! and this just shows how much you guys are uninterested in this process ! !